CARFAX Certified 2 Owners - No Accidents - Fully Serviced - QUALITY CERTIFIED up to 10 YEARS 100,000 MILES WARRANTY Quality Auto Center is honored to present a wonderful example of pure vehicle design... this 2013 Subaru BRZ Premium, 6 Speed Manual - CARFAX Certified 2 Owners - No Accidents - Fully Serviced - QUALITY CERTIFIED up to 10 YEARS 100,000 MILES WARRANTY only has 36,857mi on it and could potentially be the vehicle of your dreams! If you are looking for a vehicle with great styling, options and incredible fuel economy, look no further than this quality automobile. Exceptional in every sense of the word, this incredibly low mileage vehicle is one of a kind. Take the guesswork out of where you are going with the top-tier navigation system found on this exceptional Subaru BRZ. 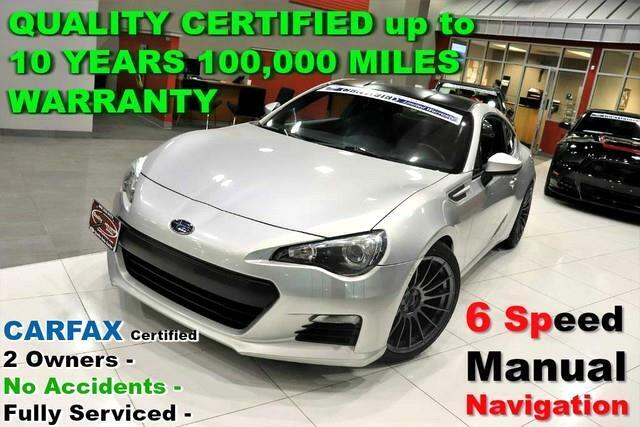 Feel at ease with your purchase of this Subaru BRZ Premium, 6 Speed Manual - CARFAX Certified 2 Owners - No Accidents - Fully Serviced - QUALITY CERTIFIED up to 10 YEARS 100,000 MILES WARRANTY, all records are included allowing you to truly know what you're buying. Looking for a Subaru BRZ that is in great condition inside and out? Take a look at this beauty. High performance is what this vehicle is all about. You will be reminded of that every time you drive it. This Subaru BRZ comes equipped with new tires at no extra charge. There is no evidence of prior damage or paintwork on this Subaru BRZ Premium, 6 Speed Manual - CARFAX Certified 2 Owners - No Accidents - Fully Serviced - QUALITY CERTIFIED up to 10 YEARS 100,000 MILES WARRANTY. This is your chance to own the very rare Subaru BRZ. We are proud to offer this 2013 Subaru that truly a must-have. This vehicle's wheels are one of the many attractive features that this BRZ Premium, 6 Speed Manual - CARFAX Certified 2 Owners - No Accidents - Fully Serviced - QUALITY CERTIFIED up to 10 YEARS 100,000 MILES WARRANTY has to offer. More information about the 2013 Subaru BRZ: The BRZ was designed and engineered for performance, and it's neither a chopped version of a sedan nor a performance version of more basic coupe so it's impressive that the BRZ is priced so affordably. With pricing that starts at $26,295 and less than $30,000 in top-of-the-line Limited form, the BRZ is one of the best performance deals for weekend racers, or anyone who judges performance cars by how well they tackle the corners--not just the straightaways. In this way, the BRZ delivers the kind of performance bargain enthusiasts crave. It also makes enough sense for daily driving, with enough features to make commuters happy plus EPA highway ratings of up to 34 mpg highway. Interesting features of this model are Superb, balanced handling, strong feature set, classic sports-car look and feel, rev-happy engine, quick, responsive steering, and standard navigation system No Credit / Bad Credit / No Paystubs, No problem !! ! All Approved ! Everyone drives ! CLEAN, GORGEOUS, LOW MILES, SHOWROOM CONDITION. CALL NOW QUALITY CERTIFIED up to 10 YEARS 100,000 MILE WARRANTY , To Certify a vehicle, there will be an additional cost for Certification. CALL NOW For details. STUNNING AGGRESSIVE LOOK ON THIS BEAUTIFUL--Call today to schedule a test drive... Good Credit/Bad Credit/No problem!!!! Get paid cash? No problem!! 100% Credit Approval with interest rates starting at 2.49% for qualified customers, our rates will not be beaten. We price our cars at wholesale price to guarantee the best deals for our customers. Our inventory moves quick, please call to confirm the availability of the vehicle of your interest Springfield location 973-564-0112. This vehicle is located at our SPRINGFIELD location. Come visit our new showroom in Springfield NJ. Contact Quality Auto Center today for information on dozens of vehicles like this 2013 Subaru BRZ Premium. If you are looking for a vehicle with great styling, options and incredible fuel economy, look no further than this quality automobile. Low, low mileage coupled with an exacting maintenance program make this vehicle a rare find. You could keep looking, but why? You've found the perfect vehicle right here. More information about the 2013 Subaru BRZ: The BRZ was designed and engineered for performance, and it's neither a chopped version of a sedan nor a performance version of more basic coupe so it's impressive that the BRZ is priced so affordably. With pricing that starts at $26,295 and less than $30,000 in top-of-the-line Limited form, the BRZ is one of the best performance deals for weekend racers, or anyone who judges performance cars by how well they tackle the corners--not just the straightaways. In this way, the BRZ delivers the kind of performance bargain enthusiasts crave. It also makes enough sense for daily driving, with enough features to make commuters happy plus EPA highway ratings of up to 34 mpg highway. Strengths of this model include Superb, balanced handling, strong feature set, classic sports-car look and feel, rev-happy engine, quick, responsive steering, and standard navigation system No Credit / Bad Credit / No Paystubs, No problem !! ! All Approved ! Everyone drives ! CLEAN, GORGEOUS, LOW MILES, SHOWROOM CONDITION. CALL NOW QUALITY CERTIFIED up to 10 YEARS 100,000 MILE WARRANTY , To Certify a vehicle, there will be an additional cost for Certification. CALL NOW For details. STUNNING AGGRESSIVE LOOK ON THIS BEAUTIFUL--Call today to schedule a test drive... Good Credit/Bad Credit/No problem!!!! Get paid cash? No problem!! 100% Credit Approval with interest rates starting at 2.49% for qualified customers, our rates will not be beaten. We price our cars at wholesale price to guarantee the best deals for our customers. Our inventory moves quick, please call to confirm the availability of the vehicle of your interest Springfield location 973-564-0112. This vehicle is located at our SPRINGFIELD location. Come visit our new showroom in Springfield NJ.